Certainly, Buffalo Exchange, with 49 stores in 17 states (although that might be outdated by the time you get to the end of this sentence), isn't the resale shopping experience recently celebrated in Macklemore's "Thrift Shop." Nothing is likely going to be only 99 cents, but on the other hand, certainly you won't find anything that smells like R. Kelly's sheets. The buyers are picky, but shopping at Buffalo is generally a matter of finding too many things to buy, instead of spending an hour sorting through truly-unwearable items. 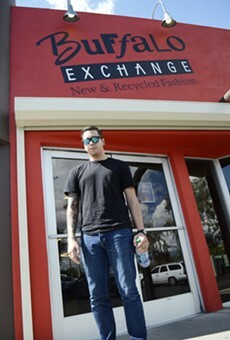 Buffalo Exchange has been a success because the formula works. Take only the best clothes and provide customers an easy, mostly affordable way to look great.